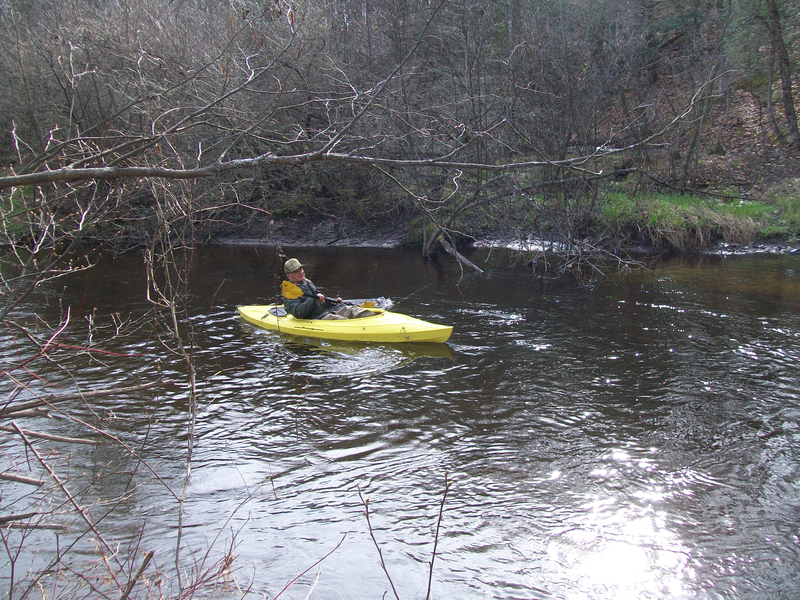 ( click on photos to enlarge, browser back button to return) Feral and I fished a stretch of the Pine River on opening day. 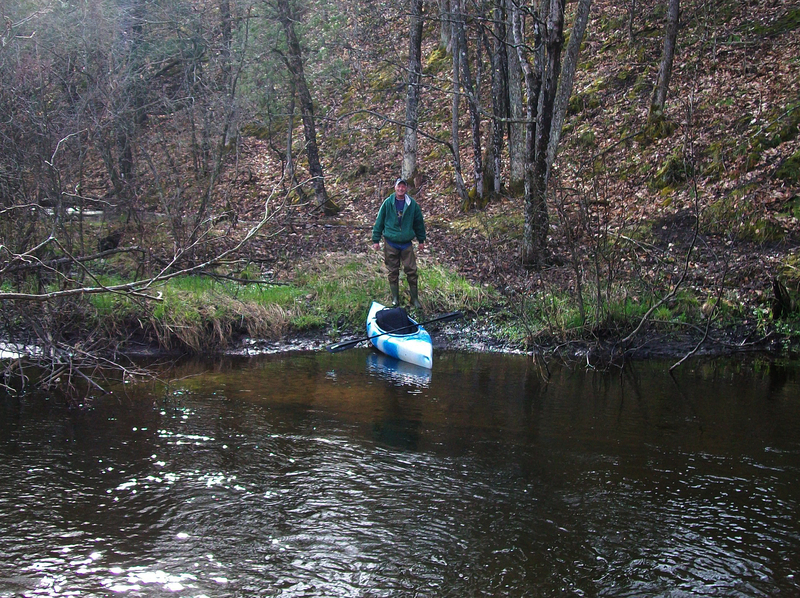 We parked at an old campsite off 6 mile road and walked downstream past a sharp bend figuring we would fish the bend then work our way upstream past the camp spot. We didn’t see any other anglers so I was surprised to hear Feral talking to someone almost immediately. He had taken the lead and was at the top of the bend. It was an angler in a kayak and he had a fish on. I didn’t see the fish so he may have released it. I took a photo (above) and soon his uncle, in another kayak showed up. They were friendly and talkative, not always the case when you meet other anglers, so I took their photos and mentioned this blog. I caught an average size brown in a hole just upstream and Feral lost one the same size upstream a little further but fishing was tough. The stream was clear as tap water and we started pretty late in the morning. So we cut the trip short and had breakfast in Tustin, then ran over to our morel mushroom area to see if they we up. Unfortunately no, but it was just nice getting out and walking through the woods. That’s a pretty broad question since I’ve caught trout on everything from deep-diving bass lures to spinners to balsa minnows to night crawlers. If the stream is clear you might try panther martin or blue fox spinners in gold or silver which can be reeled in slowly enough to tempt the trout from cover. Otherwise flashy minnow lures. Last weekend the streams were crowded all around Lake county – cars at every bridge and turnout. This weekend you may have the stream to yourself! Good Luck to you.